I was really fortunate to get to learn from masters of this tradition, many of whom were among the last generation to learn from their family instead of fiddle camps and play on home-made dance floors instead of stages. To me the history and tradition are inseparable from this music, and it’s an honor to get to be a part of passing that on to another generation of fiddlers. For information on group classes or joining the Open Old Time Dance Band (for those new to playing for dancers) or the Seattle Collaborative Contra Band (experienced dance band musicians looking to play fun dance arrangements with others), click here. Learning the fiddle can be equal parts fun and frustration at times, but my job is to make the challenge as enjoyable as possible by helping you identify your goals and the practice habits that will help you achieve them. I believe in setting a firm foundation in playing by ear before moving on to reading sheet music (much like you learned to speak before learning to translate the symbols of written English) and incorporating music theory into lessons at every level of ability so you can understand how music works and have the vocabulary to talk about it with others. I started my own journey with bad timing and a worse sense of pitch, but working with a really great teacher taught me that with patience and practice anyone can learn to do this. “I have been taking fiddle lessons from Sarah Comer for over a year and I am very pleased with the experience and the results. I am a self-conscious adult beginner and not very disciplined. Sarah’s instruction targets where I’m at musically and at the same time manages to broaden my understanding of music in general. Sarah finds music that matches my skill level with my musical tastes. With Sarah’s encouragement, I find that I take my fiddling more seriously and that my musical goals are more ambitious.” —Terese C.
“I have a 6 yr. old who has been fiddling for a few months and a 10 yr. old who is in her 2nd year. Sarah is encouraging and flexible with both. She knows how to keep my oldest challenged yet not overwhelmed, and my youngest engaged and interested. 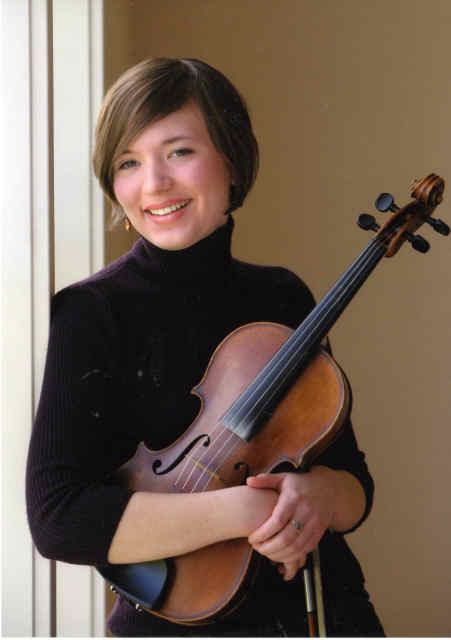 She is an accomplished fiddler and both of my kids really enjoy their time with her.” —Christine O. “I loved Sarah’s beginning fiddle class. She makes you feel like you can learn how to play the fiddle. Then, immediately, you are learning how to play some songs. She has a great sense of humor and she makes the class fun!”—Carrie F.